It’s a good idea to have a bootable emergency drive on hand, just in case disaster strikes your Mac. 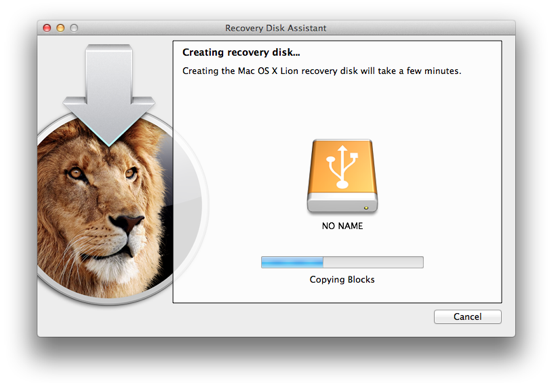 An emergency drive (also referred to as an OS X Recovery Disk) can help you repair the hard disk, reinstall the operating system, and restore from a Time Machine backup to get your computer back fast. With previous versions of OS X, you could have used the installation DVD to fix problems. But OS X Mountain Lion is sold in the App Store as a digital download — no physical disk is provided. What’s a maintenance-minded Mac user to do? Create your own bootable OS X USB drive, of course! It’s easy, and if you’ve already purchased OS X and have a USB drive that’s 1 GB or larger, it’s completely free. Carry it in your ￼￼￼￼￼￼￼￼￼￼pocket or put it on your keychain so it’s available if the worst-case scenario occurs. You’ll thank yourself for taking the time to complete this project. It can happen to any of us, even those who own brand-new Macs. First your computer starts freezing infrequently, then crashing more often, and then it won’t start at all. For situations like this, you need an emergency drive on hand to start up your computer and troubleshoot the problem. Emergency USB Drive: Creating a bootable USB drive is your safest bet. This device is self-contained and kept entirely separate from your computer — and any potential problems associated with it. But if you don’t want to create a USB drive, you may have access to two other types of emergency drives, depending on when you purchased your Mac. Recovery HD: Every Mac running OS X Lion and later has a hidden Recovery HD partition that can be used to boot the computer and repair the hard disk. (To use the Recovery HD partition as your startup disk, hold down Command-R at startup or, if that doesn’t work, option.) But the Recovery HD probably won’t work if the internal hard drive is damaged. When you can’t boot from the regular startup disk, chances are you won’t be able to boot from the Recovery HD either. Internet Recovery: Macs purchased after OS X Lion was released have an additional feature called Internet Recovery, which works even if your internal hard drive is damaged. If there’s a problem with your computer, it can network-boot from Apple’s servers. First, your computer’s memory and hard drive are checked for major issues. If none are found, your Mac downloads and boots from a Recovery HD image. But even if your Mac has this feature, you’ll still benefit from having an emergency drive, as it can take a while to download the Recovery HD partition. If you don't have a spare USB drive, you'll need to purchase one. We recommend the Amazon Basics 8 GB USB Flash Drive, which is a simple and affordable option available for less than $10. The best option is a Recovery HD partition on a bootable USB drive. This drive provides you with all the tools you need to troubleshoot problems, repair the hard drive, reinstall OS X, and restore from a Time Machine backup. In short, it’s the perfect safety net for those rare times when your internal hard drive is hosed. Warning: You cannot create a recovery disk while FileVault is enabled on your computer. Disable FileVault before proceeding with these instructions — you can enable it again after you have created the recovery disk. Open the Recovery Disk Assistant application. It’s available for free from Apple’s website. Accept the license agreement. The Recovery Disk Assistant window appears, as shown below. Select the disk and then click Continue. Disk Assistant creates the recovery disk, as shown below. The process takes approximately five minutes. When the recovery disk has been created, click Quit. Like the Recovery HD partition on your startup drive, the emergency drive is invisible when it’s connected to your computer. The Finder won’t provide any indication that it exists, but don’t worry — it’s there, waiting for your signal to help with a disaster!